Built in an astounding 103 days in 1960, McMahon Stadium replaced the dilapidated Mewata Stadium as the Stampeders’ home field. Peter Rule of Rule Wynn and Rule was the architect of the new stadium while the contractor was Burns and Dutton Concrete and Construction. The stadium was built on 40 acres of land with a 99-year lease from the City of Calgary. The property was part of a parcel of land that had been set aside for a new university in the city. Calgary oilmen Frank and George McMahon donated $300,000 to the university for the stadium construction and guaranteed an additional $750,000 in debentures. On Aug. 8, 1960, Malcolm G. Taylor of the University of Alberta in Calgary officially christened the new structure McMahon Stadium in recognition of the brothers’ significant contributions to the project. A six-member McMahon Stadium Society was established to administer the facility. 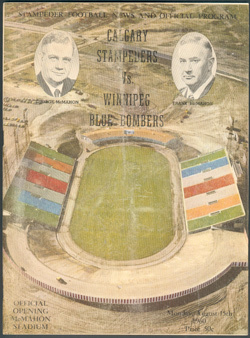 The first game at McMahon Stadium would be played on Aug. 15, 1960, as the Stampeders dropped a 38-23 decision to Winnipeg. Calgary’s first victory in their new home came on Aug. 29 as the Stamps knocked off the Saskatchewan Roughriders 23-15. Since moving into McMahon, the Stampeders have posted a 304-157-8 regular-season home record, including a remarkable 77-13 mark during the 1990s. Calgary has finished first 14 times during the McMahon Stadium era while winning 14 West Division finals and six Grey Cups. 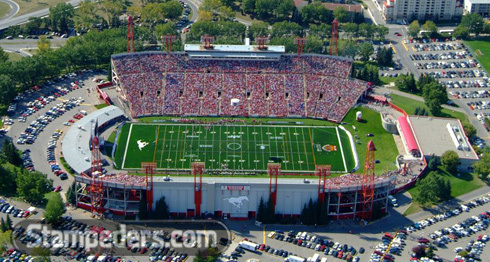 In 1975, a $1.125-million expansion was initiated at McMahon Stadium as Calgary prepared to host the Grey Cup that year. The major expense was the installation of artificial turf to replace the original grass field. The new turf allowed McMahon Stadium to become a multi-purpose community facility. Whereas the stadium previously was limited to approximately 15 professional and university football games per year, McMahon became the site of an additional 400 amateur events covering a variety of sports. In 1978, the stadium received a $4.5-million facelift that included the installation of 7,000 additional seats — bringing capacity up to 34,638 — and the addition of amateur sports facilities, an underground tunnel and a new press box. Further improvements, which included new turf, a new sound system and additional seating, took place over a five-year period starting in 1983 as McMahon Stadium prepared to host the opening and closing ceremonies for the 1988 Winter Olympics. In 2013, new improvements were made to McMahon stadium including aluminum benches in select sections being covered with fitted seats. Additionally, technology has been added in the form of a TELUS cellular signal booster and new LED sideline signage. In 2014, a new 30×50-foot scoreboard and 11x-40-foot auxiliary were added as well as a new FieldTurf surface to replace the turf that was installed in 2006. In addition, the concourse was expanded with additional washroom facilities and concessions. McMahon has been the site of four Grey Cup contests — in 1975, 1993, 2000 and 2009. Other events that have taken place at the stadium over the years include a visit by Queen Elizabeth II in 1990, the opening ceremonies of the 1997 World Police/Fire Games, the 2011 NHL Heritage Classic, Lilith Fair and many other concerts featuring such acts as the Beach Boys, Bob Seger, Chicago, the Doobie Brothers, the Eagles, Supertramp and Alabama.